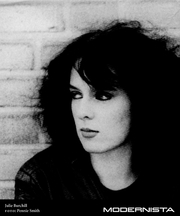 Julie Burchill (born 3 July 1959, Frenchay, Bristol) is an English writer and columnist known for her provocative comments. Beginning as a writer for the New Musical Express at the age of 17, she has written for newspapers such as The Sunday Times and The Guardian. She is a self-declared "militant feminist". She has several times been involved in legal action resulting from her work. She is also an author and novelist, her 1989 novel Ambition being a bestseller, and her 2004 novel Sugar Rush being adapted for television. Julie Burchill is currently considered a "single author." If one or more works are by a distinct, homonymous authors, go ahead and split the author. Julie Burchill is composed of 2 names. You can examine and separate out names.